There is nothing quite like watching three sighthounds, called a Stake, intent on a white plastic bag (the lure) zipping around a large open field. It turns and doubles back on itself and changes speed - appearing to dance across the fields like a crazed rabbit. The lure is run on cords on the ground and is moved by means of an automobile motor. Someone called the Lure Operator stands on a ladder or car-top for good visibility and holds a controller that stops, starts and slows the speed of the lure. The operator's job is make sure the lure stays ahead of the hounds, not too far and not too close. It takes a skilled operator to run a safe course. A lure can travel across the ground at up to 40 miles per hour. Dogs who find it an exciting game jump and down and sometimes cry and bark to be able to chase it. When they are brought up to the line by their handlers - the tension is obvious. At the call of "Tally-ho!" by the hunt master, the handlers release the dogs. The take off like a shot. A really good run by dogs that are intent on the lure is a very exciting thing to watch. As a competition the dogs are scored on how they follow the lure, their speed and turning ability. There are two organizations that run events and award championship points - ASFA (American Sighthound Field Association) and the AKC. See the history of coursing below for more information on that. The course is set up so that the hounds come back to the starting line-up and their handlers. The operator turns off the motor and the dogs are retrieved. Usually the course is run twice. The second time reversing the direction that the lure travels. And you go home with tired, but happy Irish Wolfhounds. Although humans have used dogs for hunting for as long as recorded history exists (and evidence supports their use way before then), coursing events as we know them today were developed by open field coursing enthusiasts (National Open Field Coursing Association) in the west and southwestern USA during the 60s and 70s. When faced with the facts that only a handful of states allowed pursuit of live game with dogs, and that urban encroachment and the limited supply of wild game would soon limit their sport, they searched for a suitable alternative. After some trial and error, they developed an artificial lure that would enable them to set up an imitation hunt that their dogs could enjoy without risking their safety (there are few wild animals, little rough terrain, and no barbed-wire fencing hazards on the modern day coursing field). They started with the idea of attaching a lure to a piece of moving string, and quickly adjusted the process to use a continual loop around pulleys driven with a motor. The American Sighthound Field Association was formed in 1972. Some of the first lure coursing trials were held by the ASFA and were open to Afghans, Borzoi, Greyhounds, Irish Wolfhounds, Salukis, Scottish Deerhounds, and Whippets. The eligible breeds were expanded to include Basenjis, Ibizan Hounds, Pharoh Hounds, and finally Rhodesian Ridgebacks. The American Kennel Club accepted lure coursing under its Performance Events Department in 1991, and both groups continue to sanction meets and trials today. There is a type of collar for coursing called a slip lead, which is worn only to control the hound prior to "release". The collar drops away as the hounds are released to chase the lure and they run without anything around their necks which could be dangerous. The photos illustrate one position for holding the slip lead. Notice the loop is around the handler's wrist. When the right hand releases the strap - it slides through the ring - and the collar drops off & is left dangling from the handler's wrist and out of the way. If you are not careful when releasing an excited dog - you can end up with the strap wrapped around your finger, hurting you, or the dog taking off with the lead still wrapped around his neck. The lure operator will stop the course if that happens. Here is a hound modeling a coursing "blanket". There are three colors used when coursing so the judges can tell which dog they are looking at from a distance. They are either blue, pink or yellow. Another sport that the hounds enjoy is the Large Gazehound Racing Association – straight racing. It is a short sprint of 200 yards, run three times over the course of a day. It is judged simply by speed. The first one to cross the finish line wins the heat. A maximum of four hounds run in each heat. 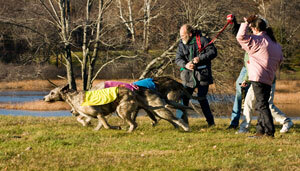 They wear blankets very similar to the lure coursing blankets – the colors are white, green, red and blue and they have numbers on them in addition to help identify the dogs as they cross the finish line. The dogs also run muzzled for LGRA racing because the lure is an expensive ‘bunny’. It is a real animal skin wrapped around a ‘squacker box’ that makes noises all the way down the course. The dogs LOVE the bunny that LGRA uses. In the smaller breeds the dogs use a starting box similar to the ones used at professional dog races, but the Irish wolfhounds are hand-slipped. In this sport they are allowed to run with collars – which makes it much each to retrieve them at the end of the course. It takes two people to run a dog – one to slip them at the start and one to catch them at the end.